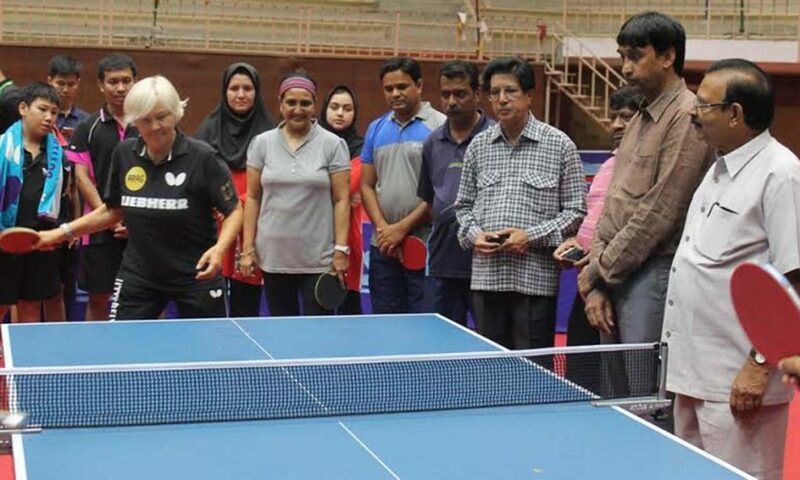 Home for the ITTF World Junior Circuit Finals earlier this year, the Indian city of Indore was the recent host for an Asian Regional Hopes Follow-Up Camp. Organised under the auspices of the ITTF Development Programme for players born in 2004 and 2005, play commenced on Sunday 7th August and concluded on Saturday 13th August; the first six days being scheduled for a training camp, the concluding day being reserved for the ever popular Challenge tournament. The head coach was Germany’s Eva Jeler, supported by Thailand’s Parinya Nonsagate. Venue for proceedings was the Abhay Prashal Stadium, a total of 22 players, 11 boys and 11 girls plus five local players who performed the role of practice partners attended. Similarly 11 coaches accompanied the young players. Each day, training started at 9.00am with 30 minute warm up followed by practice from 9.30am to 12.30pm and then a further session from 3.30pm to 6.30pm. Notably in addition to India, players from Iran, Lebanon, Pakistan, Saudi Arabia, Sri Lanka, Syria and Thailand participated. Matters concluded with a tournament, the host nation’s Payas Jain and Divyansh Srivastava finished as the most successful boys followed by Iran’s Navid Shamsshahrababaki and Pakistan’s Umman Khawaja. Meanwhile for the girls, India’s Kavyastree Baskar topped the list followed by colleagues Manjunath Amargya and Saini Suhana alongside Thailand’s Paypath Pilaisaengsuree.